I digress. . . The other day I was talking to John and a song popped into my head. I was instantly taken back to the middle 1990s Lysterine commercials that showed a bottle of "Cool Mint" Lysterine (or some other kind) swinging on a vine through a jungle. Now, that's not all that amazing, rather it is amazing to me that I cannot, though I try, get the song out of my head. I had to know what it was and where it came from. 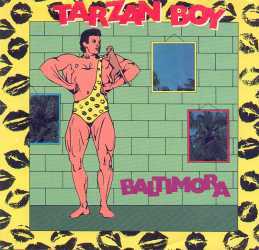 According to my research the song is "Tarzan Boy" by Baltimora. Baltimora was the pseudonym for Jimmy McShane, from Londonberry, Northern Ireland, who topped the Brit charts in 1985. The song actually reached number 13 here in the states in 1986. This was McShane's only hit making him just one in a long list of one hit wonders. The song appeared remixed on the soundtrack to one of the Teenage Mutant Ninja Turtles. It also appeared on the soundtrack for the Chris Farley movie, Beverly Hills Ninja. Apparently the song works with crappy martial arts pseudo kids comedy/action movies. And, at the risk of sounding like some overrun VH-1 show, where is he now? McShane apparently died at the age of 37 in 1995 of AIDS. Now, hopefully, I can put this song out of my head and to rest . . . unless someone knows where I can get an MP3 of the song.